**Post contains affiliate links, all thoughts are 100% my own. I've always loved to write. Even as a little girl, I was creating stories in my head. So I suppose it was no surprise that when I started struggling more with anxiety, my mom suggested starting a journal. For many, that brings on the image of a young girl and her diary. Aren't we too old for that? Journaling is much more than that. It can be a great way to get your inner thoughts out. As we write about the events of our life, we can better reflect on them. We can look back on our past mistakes and learn and grow from them. Plus, it's easy, right? Just write. But sometimes we need a little extra help. We have all these thoughts going through our heads but struggle to focus them and just get started. That brings me back to my high school English class. Each day on the board a word, topic or phrase would be written for us to journal about. In those days, I wasn't a fan. I already had so many ideas, I didn't need it. Looking back, I realize it gave us a starting point to work from and inspired us to write more. Want to read more? 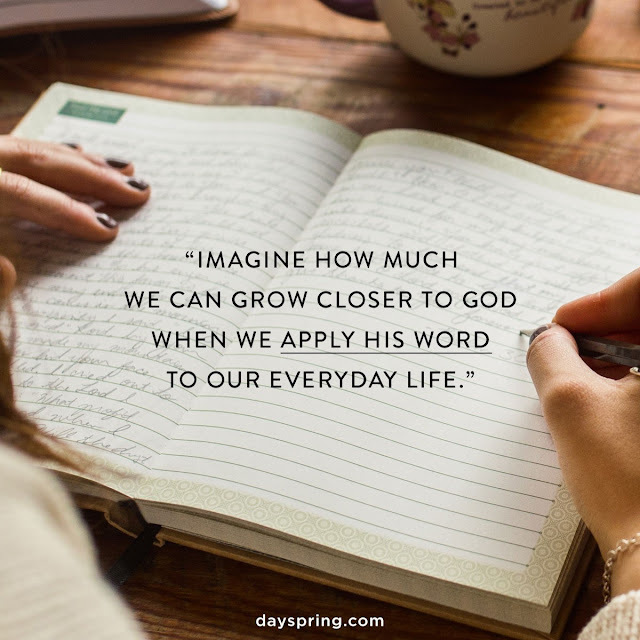 You can check out my complete post on devotional journals over on Dayspring, and don't forget to shop their full selection of devotional journals. Remembeer to use the code 25FORYOU to save 25% off your order (no minimum) and FREE Shipping! Oooh I LOVE this!! Something I would love to start each morning with!! Devotional, journaling and coffee! !